Following on from the controversial way the new Government was formed – whereby kingmaker Winston Peters chose a coalition of losing parties instead of the winning National Party – the 52nd Parliament also got off to a controversial start. 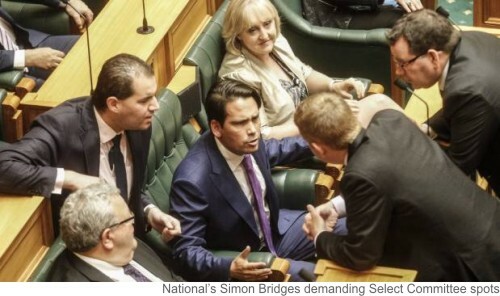 National scored a significant win against the Government in the very first minutes of the new Parliament when they threatened to call a vote to oppose Labour’s choice of Speaker – unless they were given more Select Committee spots. With five Government MPs missing from the swearing-in session, Labour was unable to use their proxy votes, leaving them short of their full contingent of 63 votes in the 120 member Parliament. Unsure of whether they had the numbers to win a vote in the House, National took advantage of their confusion to settle a row over Select Committee places. Since 1996 there had been 120 Select Committee places in Parliament, but with some opposition parties struggling to cover all of their Committees, the Standing Orders Committee had recommended a reduction in numbers. They decided not to set a number in the Standing Orders – the rules under which Parliament operates – but to leave it to the discretion of the Business Committee, with a suggested target of 96 seats across 12 Select Committees. Under Standing Order 185, “The overall membership of subject select committees must be proportional to party membership in the House”. But with only 96 spots available, National, the largest party in our Parliament – and the largest Opposition in our history – had an entitlement that left some MPs without a Select Committee membership. Select Committee work is extremely important to opposition MPs, as it enables them to not only scrutinise new legislation, but through departmental reviews, hold the government to account. National had requested the Business Committee increase the number of Select Committee places to 108, giving them 51 spots, so that apart from the two whips, Leader, Deputy Leader and Deputy Speaker – who don’t normally serve on Committees – all of their 56 MPs would have a role. But such an accommodation meant Labour would have to cover four more Select Committees, with one extra for New Zealand First and the Greens – so they refused. They claimed that their extra large executive of 31 Ministers and Under-Secretaries – who don’t serve on Committees – had already put too much pressure on their backbench MPs. The deal in Parliament on Wednesday gave National the extra Select Committee spots requested, in return for supporting Trevor Mallard as Speaker. But the whole fiasco made the new government look amateurish. That was compounded when they tried to talk their way out of their embarrassment. They claimed they gave in to National to avoid a contested election whereby the Speaker would be elected only by a slim majority. But over recent years, contested elections for Speaker have become the norm. In 2014, when David Carter was nominated by National for Speaker, New Zealand First contested the election by nominating Ron Mark. David Carter won by 93 votes to 13, with 12 abstentions. And in 2013, when National nominated David Carter to replace the outgoing Speaker, Lockwood Smith, Labour nominated Trevor Mallard for the job. David Carter won by 62 votes to 52. It is indeed ironic that it took the fiasco over the Speaker to force Labour to find their spirit of cooperation over National’s completely reasonable request for more Select Committee spots. But it is even more ironic that on the very day that the Prime Minister chose to publicly climb onto her high horse about the need for Parliamentary parties to work together, it was revealed that her Deputy Prime Minister is attempting to sue the Opposition – but more on that shortly. To compound Parliament’s controversial start, in spite of railing vociferously against National’s use of urgency over the last nine years, calling it outrageously anti-democratic, Labour, New Zealand First, and the Greens all agreed that the first item of coalition business – Paid Parental Leave – would be introduced under urgency. Urgency is a provision that allows the House to sit for extended hours in order to ram through legislation that bypasses the democratic process. Labour argued that their paid parental leave private members bill had been through a Select Committee process, so public submissions were not warranted. But not only is it over two years since that Bill was introduced, but it is also the only Private Members’ Bill ever to have attracted the Government’s financial veto because of the cost. There is a world of difference between Members’ Bills, which are usually light on detail, and Government Bills, which are accompanied by Cabinet papers and departmental reports. They are also subjected to rigorous Regulatory Impact Statements, which provide a high-level summary of the problem being addressed, the options and their associated costs and benefits, the consultation undertaken, and the proposed arrangements for implementation and review. No such analysis has been carried out on Labour’s Parental Leave and Employment Protection Amendment Bill, and nor has it been costed by Treasury. By undermining due process and denying the public the right of consultation, Labour is demonstrating arrogance and a lack of respect for democracy. But it’s not just the Government as a whole that’s been controversial – so too have some of the new Ministers. The new Minister of Police, Stuart Nash didn’t see the incongruity of announcing that to fulfil the promise of 1,500 new sworn officers, he would recruit them from overseas. The policy lasted only a day. A whispered exchange between the new Minister of Veterans’ Affairs and the Prime Minister, on the stage at the RSA’s National Council opening, led New Zealand First’s Ron Mark, to promise RSAs government funding. Labour’s new Housing Minister Phil Twyford announced that the new Government is planning to seize privately-owned land for housing projects – if the owners get in the way of their building programme. It also turns out that Labour’s promise to build 100,000 new homes may not actually mean building them – but buying some already-built homes instead. The new Health Minister David Clark wants all District Health Board chairmen to submit a letter of resignation, which he’ll reject if they are on the same wave length as he is – otherwise they’ll be axed. The new Justice Minister Andrew Little is claiming that the three strikes law doesn’t work and is planning to fast-track its repeal – in spite of that not being signalled in their 100-day plan. The new Minister of Education, Chris Hipkins promised to scrap charter schools, but following rebellion within his own ranks – plus the reality of signed Crown contracts, employed staff, leased premises, and other promises – he’s now talking about integrating them into the state system instead. The first year of free tertiary education is due to start in February, but it’s already November and the universities haven’t been told how it will all work. They’re also worried that admissions may increase by 15 percent. Nevertheless, students are being told to go ahead and apply. All of this rush is leading to growing calls for caution. Trying to implement the huge raft of major policy and legislative changes announced by the Governor General in the Speech from the Throne – see HERE – within 100 days, is not just foolish, it’s reckless. With brand new Ministers, a new coalition, and a huge policy agenda that hasn’t been costed, nor assessed by officials, the plethora of unintended consequences that will undoubtedly result from this rushed agenda, will be bad news for the Government – and for the country. However, while the first day of Parliament was regarded as somewhat farcical, the actions of the Deputy Prime Minister Winston Peters are causing anger. The fact that he signed “discovery” papers against senior National Party MPs the day before the election, has led many to conclude that Mr Peters never intended entering into a coalition with National – that he simply strung everyone along, including voters, because it suited him to do so. Those serious assertions go straight to the heart of trust and integrity in our democratic system. The legal action centres around the leak of details of his Superannuation overpayments during the election campaign. The saga began back in July – at the time the Green Party co-leader Metiria Turei was admitting benefit fraud – when Mr Peters received a letter from the Ministry of Social Development saying his pension was being overpaid. He’d been collecting super since 2010, when, while living with his de facto partner Jan Trotman, he signed up. But for seven years he’d been paid more than he was entitled to. Once the overpayment was brought to his attention, he says he immediately paid it back. During a routine operational briefing, the Ministry of Social Development’s chief executive Brendan Boyle was informed of the case. He discussed it with the State Services Commissioner Peter Hughes to determine whether it was a matter that should be brought to the attention of Ministers under the Government’s ‘no surprises’ policy. The Social Development Minister Anne Tolley and the State Services Minister Paula Bennett were both informed, and in turn they advised the Prime Minister’s chief of staff Wayne Eagleson. All have denied any part in leaking the information to the media. Legal papers have now been served by Mr Peters on MPs Bill English, Paula Bennett, Steven Joyce, and Anne Tolley, National’s former chief of staff Wayne Eagleson and staffer Clarke Hennessey, the MSD’s Brendan Boyle, and journalists Tim Murphy of Newsroom, and Lloyd Burr of Newshub. Mr Peters wants to “identify” then “sue” the people responsible for the leak. This legal action, which seeks discovery of information relating to a leak – including emails and phone records – is to ascertain who to sue. Media freedom advocates are outraged by these developments. They say that Winston Peters’ attempt to force journalists to disclose their sources will have a chilling effect on democracy. “Post-election, Peters entered into – indeed orchestrated – what were held out to be ‘good faith’ negotiations with both parties on possible coalition arrangements. Both parties believed they were in with a chance – in fact an equal chance – and Peters was happy to encourage this belief. It suited him to do so because that way, both Labour and National would be keen to do business with him. “But realistically, what chance was there of Peters going into coalition with National when he was simultaneously – apparently unbeknown to anyone but his lawyers – taking legal action against senior National ministers and officials? What sort of hopelessly dysfunctional government would it have been if the deputy prime minister (let’s assume his appointment to that role would have been one of the conditions of any NZ First deal with National, as it was with Labour) was suing the prime minister? Given Mr Peters is not letting the superannuation scandal rest, perhaps it’s appropriate that there is further enquiry into the circumstances that gave rise to Mr Peters receiving substantially more in National superannuation than he was entitled to. As the Deputy Prime Minister it is important that the public can have confidence that his actions were all above board. To that end, Mr Peters should instruct the Ministry of Social Development to publicly release the file on the matter. Should Winston Peters authorise the release of the file relating to the overpayment of his superannuation allowance?